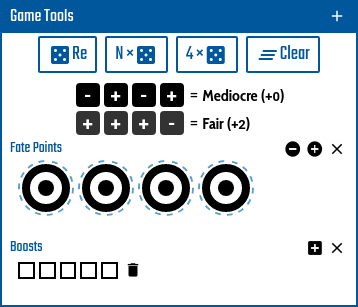 This application offers a shared game table for playing Fate Core or similar games. Games which are primarily about sharing short text notes. There is no chat/audio/video support. Use the application together with other conference software, such as Skype or Hangouts. Using the name and the password to enter the game will always open it with full access to the all game data. This is intended for use by the GM. The non-GM player should enter the game using the join link obtained from the GM. The join link can be shown by clicking on link button. The Fate Core is fully cooperative play with lots of information openly shared between players. Thus in the application the game content can be seen and edited by anyone. The difference between opening the game as GM and joining the game as Player is that the non-GMs cannot look into the Graveyard and other custom tables. So they will not loss the element of surprise by accidentally seeing what the GM has prepared for them in advance. Please, DO NOT USE passphrase, which you are using for other services (like your email account), as the game password. Sharing passwords between services is the bad practice in general. This site is not using secured HTTPS protocol and your password (or game data) can be read by anyone sitting on the path between your browser and the server. You can switch the Application to another supported language using button language in the header bar. The game table is empty screen representing the real table top. The game is played by placing various note cards on the table for keeping the state of the game. Its up to you what card will you use. There is no game mechanics connected with the cards. Beside the Main Table there exists additional table for the GM that can be used to prepare new cards in advance or to keep the private notes. The table is called Graveyard and you can move any card from the Main table to it by clicking on the archiveBury button. The cards in the Graveyard can be modified and later returned back to the Main table using unarchiveRevive button. The Graveyard is visible only to the GM. For larger games prepared in advance the GM can use additional custom tables to better organize the game content. 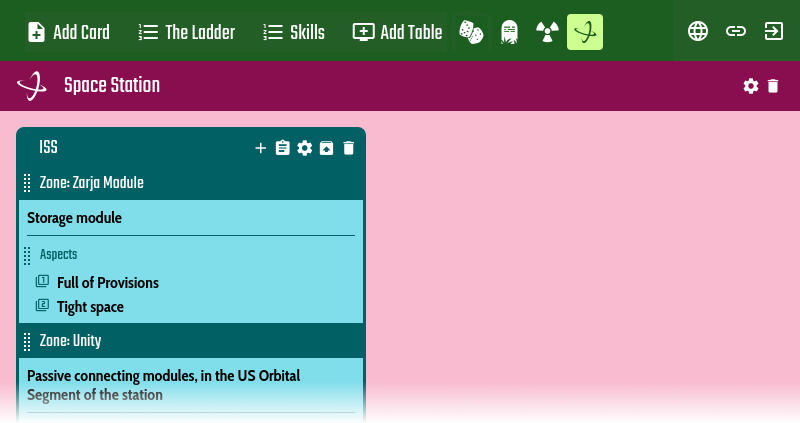 Click on add_to_queueAdd table button to add a Custom table. The Fate Ladder assign names to the roll results and skill bonuses. For a new game the Ladder is filled with the values from the Fate Core rules. You can redefine the list by clicking on listThe Ladder button. When you are editing any field containing the skill name the application will provide autocomplete for English names of skills from the Fate Core. You can modify the list by clicking on the listSkills button. There are predefined sets of skill for various languages and rule sets available in the dialog. Note cards are the toplevel holders of the shared content. Look at them as if they were note cards you use in real tabletop game. One card can represent the game aspects, other card the NPC and another one the current scene of the conflict. Each card is further divided into sections. Sections exist primarily for information formatting and are not associated with game mechanics. Even though the section name generally refers to the Fate Core game concept, it's up to you which section to use to represent specific information. Locks/unlocks the card to prevent from accidental changes to it. Almost all editing actions are disabled for the locked card. Add new section to the card. There are many types of areas prepared to hold specific information like Skills, Aspects etc. Flip the card to back side to see the general notes. The general notes is markdown formatted peace of text. It works like single page wiki. Edit card title, subtitle, color and description here. Bury the card to the Graveyard. Revive the card back to Main table or move it between custom tables. Create copy of the card. Remove the card permanently. Instead of removing the card during the game session it is better to bury it to the Graveyard so it can be modified there and later revived back to the Main table. The game tools is special card section which can be attached to any card. It contains dice pool and optionally token box and boost counter (use its own add button). The idea is that each player will have own Game Tool area attached to its PC card. 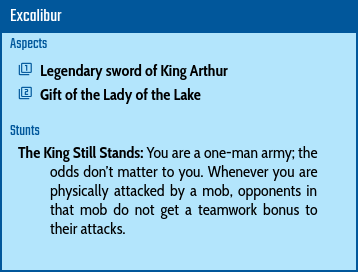 The GM can attach his area either to the card representing the Game or the current Conflict Scene. Dice pool is integral part of the Game Tools area. You are makeing dice rolls here. Roll arbitrary number of fate dices. Re roll some of the dices from the last roll. Token box can be attached to the card or to the game tools area within the card. Use the token box name to describe what the tokens represent (for example Fate Points). The tokens can be added or removed to the box using add_circle and remove_circle button or dragged between the boxes with the mouse. Extra / Zone area is specific section because it can contain other sections. It works like card in card. You can use it to group together related data (for example of one Extra or Zone).